Recently the JBC just got over 1000 hits! A big thanks goes out to all of the fans that read the JBC each week. We couldn't have done it without you! We have a special gift for you too. Send in a reply and get a special JBC animated icon! Thanks for helping us reach 1000 hits. Also the JBC is proud to announce that it has gained three new staff members. You can check out their articles in future issues. Here at the JBC we believe that we can never have too many staff members. Last week a startling discovery was made at Ed's house. Deep inside his room Double-D noticed while looking at Ed's filthy bed a whole colony of dust mites. Life was in fact found in Ed's room. Although in may only be microscopic it still is a living breathing object. No other signs of life have been found in Ed's room. Edd thinks the reason for these animals to exist is because of the climate and all the filth that exists in his room. "I thought that nothing could possibly survive in Eds room." "The reason is because of all of the junk and poisonous left over food." "I mean no bugs were even found in there!" (Edd) A further investigation is under way to determine just how these animals survived in the filthy place that Ed calls home. The JBC had to get an expert's opinion on the matter at hand so we quoted our own Dr. Eric. "Im as astounded as everyone else here." "I have no idea how any life could survive in that room." "These dust mites would have to be mutated to live in that type of climate." Edd captured a couple of the specimens to examine their DNA to see just how they survived. The answer could be found in the armchair that is in his room. Recently Ed has heard some very strange noises and movements coming from within the chair. Edd fears that if these creatures go unchecked it could disturb the delicate balance of life. Apparently while the neighborhood beauty queen Nazz was tanning by the creek someone snuck up and cut off some of her hair! She only got a glimpse of this person, enough to tell it was a boy, but no facial features or clothe descriptions were given. She is currently hiding in her house with a brown paper bag over her head. She has allowed us to come in and ask her questions about the incident. "Do you have any idea who the culprit mightbe?" "I have no idea, why would anyone want to cut up my hair anyways?" "Perhaps for revenge, have youbeen on bad terms with anyone lately?" "Just Sarah, but this person was a guy so it couldn't have been her." 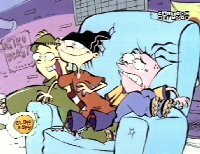 Thesuspects have been narrowed down to Ed, Edd, Eddy, Kevin, and Jonny. I have told the residents to keep me posted on any leads. There are many reasons for someone to cut a piece of her hair off but we can't talk about it now because of legal stuff. The only lead right now is that the culprit is said to be a male who maybe lurking around Nazz's house. If you have any information on these crimes or any suspects please report it to the JBC headquarters in Peach Creek. (Third house on the right) We will keep you up to date on these happenings as we receive the information. The first time Edd was passed a football it was a failure. It all started when all the boys of Peach Creek were having a football tournament, the Eds decided to go to watch. The teams were "The Peach Creek Worms" And "Park N Flush Rats". The score was pittifull for Peach Creek. A score between Peach Creek 6 and park n flush 7 in a 10 minute time limit. Park n flush almost scored when the ball was accidentally passed to the audience and was caught by Edd. he was shaking and sweating as everyone was shouting at him. He covered his eyes and threw the ball back. Threw with his eyes still covered, the score bell went off. He uncovered his eyes with everyone cheering for him. Edd had scored a point for Peach Creek.with only 5 more minutes left. Peach Creek worked their rear ends off trying to win the game.5 seconds left and they won the game! Edd felt very proud of himself as the team marched up the stairs and grabbed him and raised him in the air. I interveiwed him after the game. Connie: Edd tell me how you feel right now. Edd: Great eheh! I've never even played football and scored a touchdown before! Connie: Does this make you want to join a football team? Edd: No I'm not planning on it. All in all, this was another exiting day at peach creek. Two weeks ago in the Jawbreaker Chronicle, we reported that Sugar Haters Anonymous blocked off the entrance to the candy store with their protest denying the Eds their right to jawbreakers (see Issue 12 for more info). Today it seems, Sugar Haters Anonymous has filed a class action lawsuit against candy companies across Peach Creek, suing to have jawbreaker manufacturing halted entirely. "What these candy companies are doing is a disgrace!" I.M. Bitter, leader of Sugar Haters Anonymous said at a press conference this morning. "They are shipping out a product which they know causes mass amount of dental damage and worst of all costs millions of dollars annually to resolve. By allowing the shipment of this product we are permitting candy companies to reap rewards that they are not entitled too. It is because of this that we have no other choice but to get this extremely hazardous product removed from the shelves and out of our childrens mouths!" Backed by the wealthy members of society who have nothing better to do, Sugar Haters Anonymous hopes for a quick victory over the candy companies. Standing with the candy companies are the children of Peach Creek and most notably Ed, Edd, and Eddy. When asked if they felt threatened by their opposition, Edd had this to say. "We are simply exercising our right of freedom of speech. The candy companies have done no wrong, they have simply released a product which when left unchecked can cause minor problems. Quite frankly, I fail to see how Sugar Haters Anonymous managed to bring this to court. I am quite confident that once the judge reviews the case he will see things our way." With both sides confident that they are assured victory, the only thing we can do is sit and watch. The trial, which takes place next week will not only determine the fate of jawbreakers, but will also determine the happiness of children across Peach Creek. 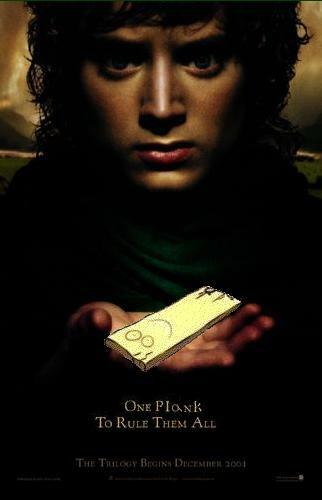 Plank has been starring in a new epic film called,"The Lord of the Plank." It's starring himself and directed and written by Jonny.Coryography,music,sound and special effects are provided by Edd.It's also starring:Ed,Rolf,Nazz,Kevin and also starring Elijah Wood and Ian Mckellan.The group has been working on the film for over a year and it has finally open to theaters.It had a red carpet opening in Peach Creek yesterday at midnight. The movie already is selling millions of tickets. Even though I was in it,I just wanted to be around Nazz and to impress her.I thought it was a real DORKFEST. "What a terrific movie but Kevin was a bad actor." Running Time:2 hrs 57 mins. "This is an amazing motion picture event!EVERYTHIG(directing,screenplay everything)IS TERRIFIC!! !It's worthy of next year's acadamy awards. This movie is guaranteed to sell out tickets on Saturday and Sunday.People are already seeing it and are excited for the upcoming sequel,"The Lord of the Plank:The Two Houses."